CG Police Notification is out. CG Police is recruiting for 655 Subedar and Sub Inspector Post (Last Date Extended) Posts. 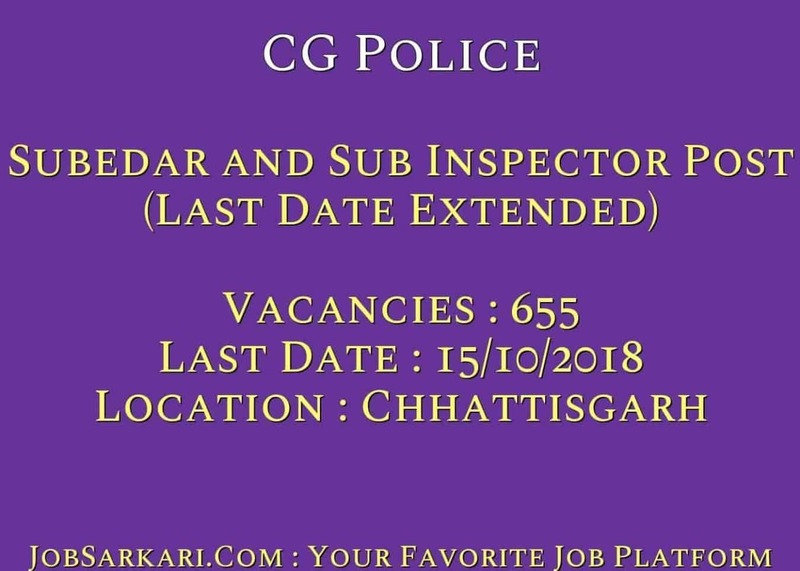 You can check CG Police - Chhattisgarh Police last date, download CG Police notification, visit CG Police official website and check other CG Police Vacancy details.Complete Vacancy and recruitment Details about 655 Subedar and Sub Inspector Post (Last Date Extended) vacancies in CG Police are provided below by JobSarkari.Com only for you. Last Date for Apply Online 15/10/2018. Subedar Candidate Must Have Passed Graduation. 08 03 00 14 25. Sub Inspector Candidate Must Have Passed Graduation. 160 53 46 122 381. Sub Inspector (Special Branch) Candidate Must Have Passed Graduation. 16 05 04 12 37. Platoon Commander Candidate Must Have Passed Graduation. 74 26 21 63 184. Sub Inspector (Finger Prints) Candidate Must Have Passed Graduation in Physics, Chemistry and Math. 03 02 01 02 08. Sub Inspector (Inquiry Documents) Candidate Must Have Passed Graduation in Physics, Chemistry and Math. 01 00 00 01 02. Sub Inspector (Computer) Candidate Must Have Passed BCA / B.Sc Computer. 04 02 01 04 11. Sub Inspector (Radio) Candidate Must Have Passed Diploma in Electrical / Electronic / Telecommunication Engineering. 03 01 01 02. 07. Total No of Post 269 92 74 220 655. 6.Online Application Can be Submitted on or Before 15th October 2018. Q. What is the Last Date For CG Police Subedar and Sub Inspector Post (Last Date Extended) Vacancy ? A. 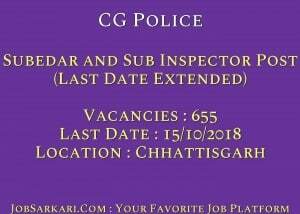 Last Date for CG Police Subedar and Sub Inspector Post (Last Date Extended) Posts is 15/10/2018. Q. What is the Form Type of CG Police Subedar and Sub Inspector Post (Last Date Extended) Recruitment ? A. The Form Type for CG Police Subedar and Sub Inspector Post (Last Date Extended) Posts is Online. Q. How many vacancies are available in Chhattisgarh Police Subedar and Sub Inspector Post (Last Date Extended) Posts ? A. There are about 700 Vacancies in Chhattisgarh Police Subedar and Sub Inspector Post (Last Date Extended) Posts. Q. What is the Full Form of CG Police ? A. Full Form of CG Police is Chhattisgarh Police .